Inexpensive Ceramic Coffee Mugs with Bands, Personalized in Bulk. Promotional, Budget Prices in the USA and Canada. Bulk custom imprinted Band Mugs. 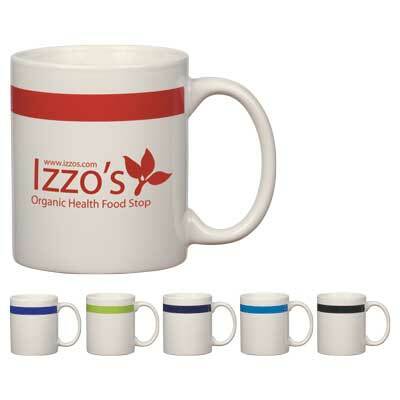 We also supply wholesale blank (not custom imprinted) Band Mugs for $1.74 each. Budget Prices in USA and Canada for wholesale promotional Band Mugs. American clients pay no taxes. The unit prices below include your 1-color custom imprint on one side. We also supply wholesale blank (not custom imprinted) Band Mugs for $1.74 each. Packaging: 24 per carton @ 24 lbs. *Mug Mailers Available.